Folks here we go again, another tasty treat from our friends down in Tasty-Town otherwise known as Chile and more specifically the Casablanca Valley. I've said it before and I will say it again, only because I think it bears repeating, the Pinot Noir coming out of this area is going to really start turning some heads and all the other media chumps are proably licking their chops to get that type of story published, because the Casablanca Valley in Chile is kicking some serious A$$ in the Pinot Noir department. I know everyone in this audience loves a yummy tasting Pinot Noir and when it happens to come in a bottle that sells just somewhere south of ten dollars, it means happy days are here again. The prices are low and the quality is filled with über goodness, feel me? This makes the fourth Pinot Noir from Chile that has really made me think, hmmm what's the bleep is going on down there? The following sentence is filed under just saying; so hey you Wines of Chile folks, if you'd like this humble [ok, maybe not so humble] cork-dork to come down and take a closer look at the goings-on in Casablanca, well I'm your man [now back to your regularly scheduled review]. 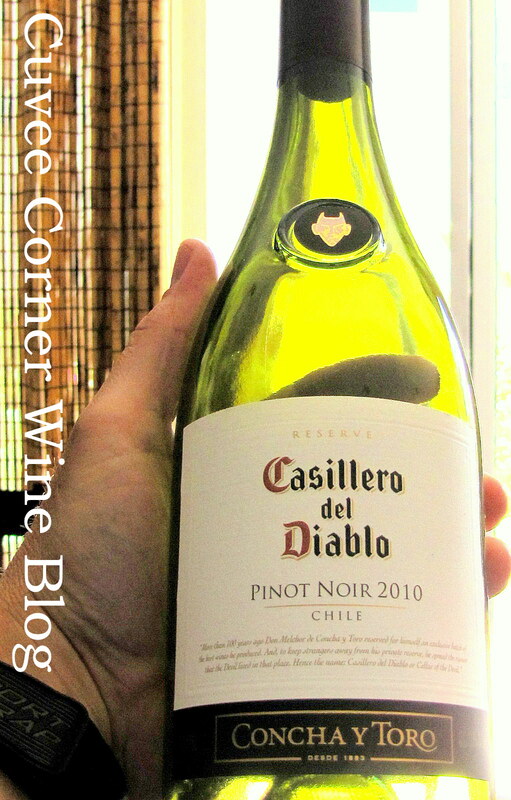 That said, in today's spotlight is the Casillero Del Diablo Pinot Noir, which impressed me from the moment I opened the bottle. Frankly folks, I'm always skeptical of inexpensive vino and typically have what only can be referred to as apparent disdain [if this makes me a snob, then so be it] for what is often your garden variety bulk juice only fit for a box, especially when the wine in question sells under $10 [most times]. Let's face it, honestly there's not a lot of wine in the ten [$10] and under category that will make me take notice, but when it earns it stripes like this wine did last night, I give credit where credit is due. But hey, what do I know, I'm just a wine-blobber. Other Voices: To build my case and prove my point with an organization that has a just a tad bit more credibitliy than myself, thus I give you a quick quote by Steven Tanzer's International Wine Cellar, who had this to say about their 2009 PN. "Vivid, spicy and straight forward and very easy to drink, with no excess"~ Josh Reynolds reporting for the STIWC. and gave this wine 87 points. Swirly, Sniff and Slurp: I uncorked this baby last night with Portabella stuffed ravioli, bathed in a truffle reduction sauce, laid over a sauteed bed of organic spinach and I sliced in some left over Pot Roast, oh-my game on. So anyways back to the glass, a beautiful, bright rhubarb colored core, tasty aromas of tart cranberry and strawberry jam freshly slid upon a toasted baguette. On the palate an immediate attack of perfectly ripe fresh strawberries and sharp raspberry's, a bit of rich earth and hint of cocoa, smooth inviting tannins and youthful but mouth watering acidity. This a great food wine or just a fun wine to sip on, while kicking your heels up on the luv-seat watching your favorite reality show. What's the score? : Weighing at just 13.8% abv and with the tastiness factor heading toward the good range, I gave this wine a solid 87 points and would recommend to anyone looking for a Pinot Noir on the expensive side of the equation. So easy on eyes and the wallet, what more could you ask for? Well folks that's all you got today, I hope you'll seek this wine out for yourself, until next time sip long and prosper, cheers! Full Disclosure: This wine was sent as a media sample for the wine review process.